What does it take to make the people of England angry? As a Scot who has spent half his life in London, the unflappable amiability of the English is something for which I have endless admiration. But when it comes to their appallingly apologetic attitude towards my homeland, I find myself longing for them to get properly riled. Yesterday, the Treasury published the Public Expenditure Statistical Analyses, its annual survey of state spending. This showed, as in previous years, that Scotland receives far more public money per head than any other part of the UK bar Northern Ireland – a total of £10,212, or a staggering 19 per cent more per person than is spent in England. The scale of public largesse is confirmed in figures published by civil servants working for Alex Salmond, leader of the Scottish National Party and the First Minister of Scotland. Last month, they released their annual assessment of the difference between public expenditure in Scotland and taxes raised there: in 2009‑10, it came to a staggering £14 billion – and that takes into account the revenue from North Sea oil and gas. Generally, the difference between spending levels in the various parts of the United Kingdom is blamed on the Barnett Formula. You have to feel sorry for poor old Lord Barnett, who must be sick of taking the flak. In fact, his eponymous formula is not to blame for this palpably unfair situation. He only looked at allocating changes in spending (whether increases or decreases), leaving untouched the bulk of the money already being transferred to Scotland, Wales and Northern Ireland. No, the problem is with this great block grant. It is meant to be based on need – but there has been no needs assessment since the Callaghan government. For more than 30 years, the underlying assumptions about how we fund the United Kingdom have not been re-examined. And this matters hugely, because while Wales might not have prospered since the Seventies, Scotland certainly has. The highest per capita earnings in the UK are in Notting Hill. The second highest? Edinburgh. This is the first dirty secret of Scottish politics: that Scotland is doing very well, thank you. When it comes to public spending, it is a mendicant nation, always looking for more. Yet before the credit crunch, Scotland had enjoyed unbroken economic growth since 1980. Yes, there was mass unemployment as old industries closed, but new strengths emerged in banking, biosciences, computer games and energy, whether oil, gas or wind. You wouldn’t know it from the way that Scottish politicians – of all parties – talk, nor from the behaviour of successive British governments. Of course, the fault here lies as much in Westminster as Holyrood. Ministers in London have been transfixed by Scotland for the past quarter of a century, terrified of getting it wrong. Tory governments mollycoddled the Scots, out of fear of unpopularity. Labour, all too aware of where its electoral support came from, did the same. This wasn’t leading, but following. The normal rules of politics, of making a case or challenging your opponents’ arguments, were suspended. Instead, what Scotland wanted, it eventually got. The resulting spending arrangements are enough to have any English taxpayer spitting blood. Yet despite several attempts to whip up righteous anger (I remember Ken Livingstone trying and failing on a number of occasions) England seems remarkably unfazed by the unfairness of how well Scotland is treated. Even the worst provocations of Alex Salmond – a great populist, a wonderful public performer, but also the worst kind of political wind-up merchant – have failed to make much difference. This despite the fact that so many of his policies are designed to anger the English. Free prescription charges; the abolition of tolls on bridges; free university education for Scots – but £9,000 a year for the English. These are all hugely symbolic policies, and all devised with at least half an eye on annoying the public south of the border. There are 400,000 English people – a population the size of Edinburgh – in Scotland. There are 800,000 Scottish people – a population the size of Manchester – in England. That’s enough, even without other family and business connections, for a lot of English families to know the second dirty secret of Scottish politics – that extra money isn’t buying better services. Yes, there’s free this and free that, but schools where spending is a third higher than in England are delivering lower exam results. Despite health spending that’s up to a fifth higher, waiting times are longer. In addition, there are around a quarter fewer police officers per head of population. In short, the lack of any overwhelming English resentment of Scotland almost certainly reflects a knowledge that Scots don’t inhabit a land of milk and honey. It is instead a country that combines a model 21st-century economy with a corporatist public sector straight out of the mid-Seventies. What does this mean when it comes to the great question of the day – the future of the Union? 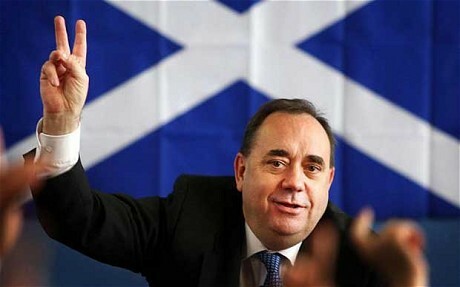 Salmond has promised a referendum within his ministerial term, but only in Scotland. Yet there is a strong case for a referendum in England as well. The Union took two nations to create, and should rightly take two to dissolve. It is certainly wrong that Scots face the prospect of a gerrymandered referendum, in which the SNP government sets the questions (they favour a multiple choice), define the rules (it would be outwith the scrutiny of the Electoral Commission), and decide the electorate (they plan to extend the vote to under-16s). It is a measure of the strong emotional as well as economic ties that bind Great Britain together that support for the Union runs so high on both sides of the border. But Britain’s politicians need to be willing to tell the truth about Scotland. That it is wealthy not by chance, but thanks to the hard work of Scots, and the policies of successive Tory and Labour governments. That it is vital to the very nature of Britain – and that the rest of Britain wants it to remain so. That it is doing well – and that it might be time to give something back. After all, the McChattering classes pride themselves on living in a generous, social democratic nation. So why should redistribution keep going to Scotland when needs are greater elsewhere? Time, surely, for Scotland to help out south Wales or west Belfast – or even the east Midlands.